A high quality camera is what separates the hobby video makers from the professionals. Gone are the days where producers would have to spend countless hours just to perform simple color correction. Most corrections are done by the camera itself. As long as you have a professional grade camera, your video will come out looking crisp. Many amateur filmmakers in different genres (ex. action sports, independent film) start out with more affordable video cameras before graduating to better quality, professional-level camcorders. 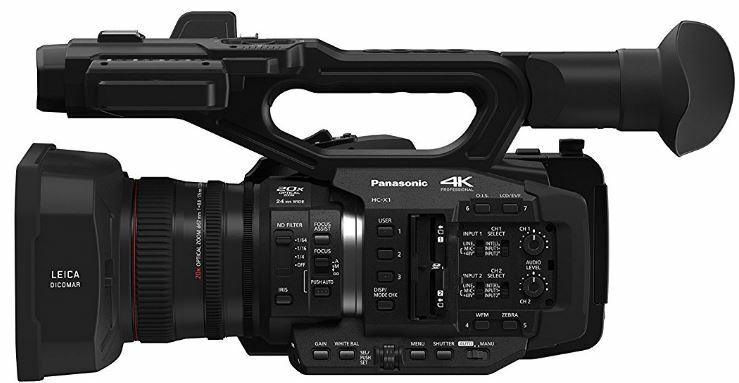 If you’re ready for an upgrade, the Panasonic HC-X1 4K Ultra HD Camcorder may help you step your game up. In spite of its light and compact body, Panasonic promises that their camera will perform as well as a professional grade model. 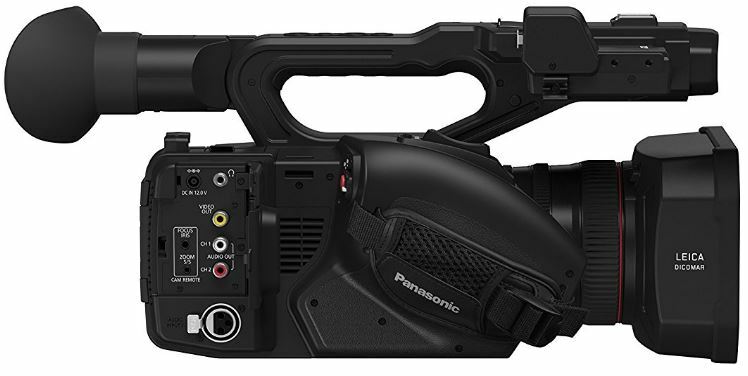 The Panasonic HC-X1 measures approximately 6.8 x 7.6 x 13.6 inches and weighs in at 4.41 lbs, making it fairly light and small relative to other pro-level camcorders of its class. The 3.5 inch 1.1 million dot OLED high-res display provides a sharp, easy to use method of reviewing your footage. The camcorder holds a 0.39-inch viewfinder that is surprisingly comfortable to use. The HC-X1 also includes a retractable touch-panel LCD that can swivel up to 270 degrees. Even when you’re holding the camera at extreme angles, you’ll still be able to see your footage in real time. There are three rings used for manually adjusting zoom, focus and the iris of the lens. 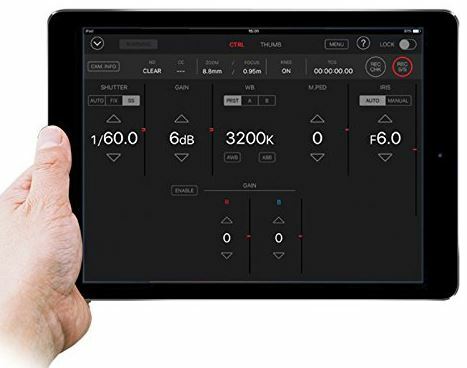 The 2-channel XLR audio input terminal allows you to record using either the 16-bit PCM system for MOV/MP4 files or the Dolby Digital system for AVCHD files. In plain English, this means that the HC-X1 is capable of producing studio quality audio. 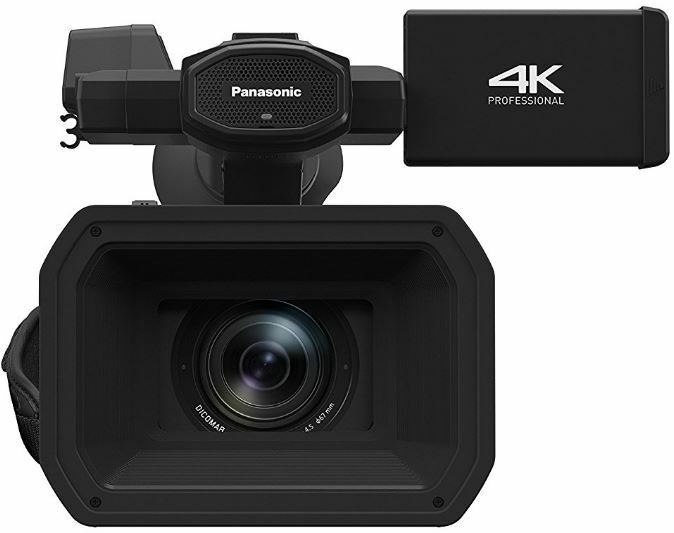 The Panasonic HC-X1 holds Panasonic’s advanced Optical Image Stabilization to correct for any shake of the camera during filming. 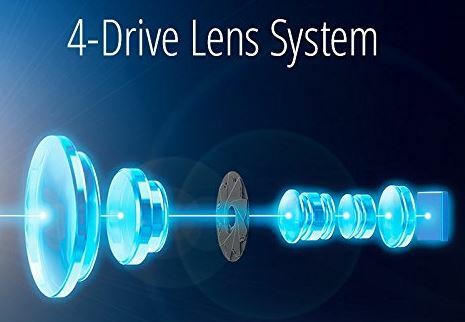 When shooting in Full HD, the camera combines optical and electronic stabilization technologies to correct for vibrations using the 5 axis image stabilization system. The system corrects shake along the following 5 axes: any movement of the camera up or down, rotation along the y axis (roll) rotation along the x axis (yaw) and tilting up and down (pitch). Unfortunately, when shooting in 4K UHD, the 5 axis system is not usable, and the camera can make use of the optical image stabilization only, limiting some of the effects of the image stabilization. Regardless, when shooting in Full HD or Ultra HD (4K) the camera effectively accounts for hand-shake and other vibrations like those produced when riding in a vehicle or attached to a cable trolley along 5 axes. The footage produced is smooth and steady. The correction area of the image stabilization is large and limits the amount of picture cropped due to the image stabilization. Panasonic’s Intelligent Autofocus allows for lightening quick focusing. The Micro Drive Unit moves very fast and with minimal vibrations to achieve focus without affecting your composition. You can also customize the autofocus settings. Autofocus Speed, Sensitivity and Area can all be adjusted to your needs depending on the setting, subject or style of shooting you’re doing. Of course, autofocus can also be switched off and controlled with a manual ring for finer adjustments or stylistic purposes. The quality of video from any type of camera will largely depend on the quality and type of lens it houses. 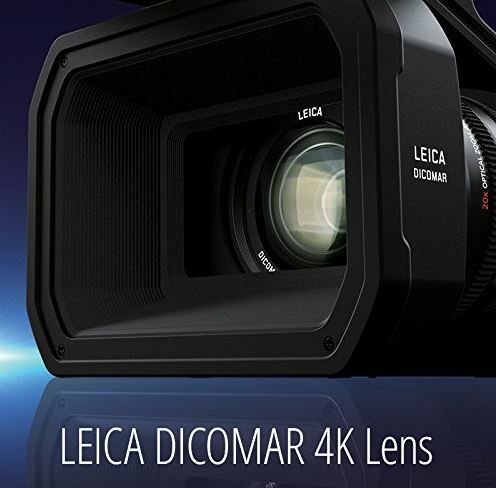 The Panasonic HC-X1 holds a Leica Dicomar 24mm 4K f/2.8-f/4.5 lens. Even at the wide-angle setting, the 24mm lens produces almost little to no distortion. This allows you to film in wide-angle mode in smaller spaces such as small hallways, airplanes, or cars with little noticeable distortion and still get that expansive wide effect. The lens has an aperture range of f/2.8-f/4.5. Such a small aperture range of wide f-numbers allows filming in low light with clear picture, even when zoomed in. 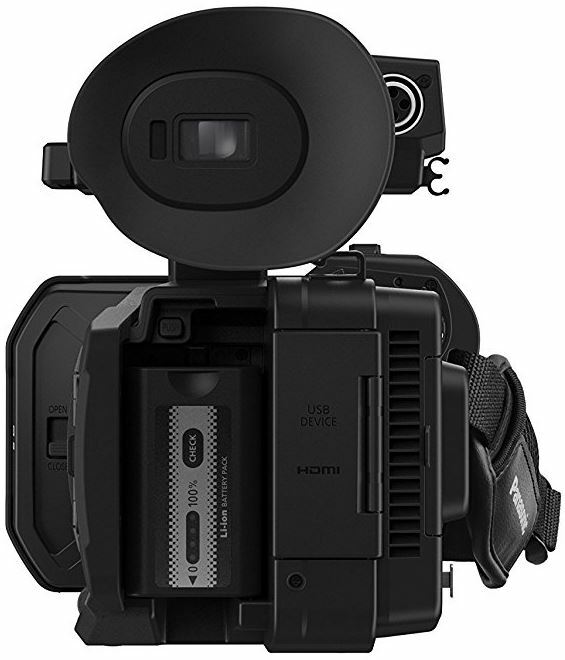 Additionally, the HC-X1 also houses a 4-Drive lens system. The system drives four separate lens groups behind the main lens: groups 2,3,4 and the iris. The system controls the drive range of each lens, which vary in size, to produce optimal images of pristine quality and powerful zoom capabilities. The Leica Dicomar lens has a focal length that ranges from 24mm wide-angle to 480mm telescopic. The lens produces an astounding 20x optical zoom. Moving from one end of the range to the other is smooth, but lightening quick. This allows you to maintain perfect composition, even in high speed environments. It’s worth noting that 20x zoom leaves the camera susceptible to shake, so be sure to double check the optical image stabilization settings are where they need to be, otherwise your videos could be shaky and out of focus. The Panasonic HC-X1 holds a 4K 1-inch MOS sensor for an effective 9.46 megapixels at 4k 24p and 8.79 megapixels when shooting in HD. The sensor provides accurate depth of field, excellent dynamic range, impressive image quality, and low noise. Videos can be recorded at various qualities, and can be selected based on what scenarios or subjects you are shooting. The highest quality possible with the HC-X1 is 4K 4096×2160 24p. The highest quality you can shoot in UHD is 3840×2160 50p, and if you drop down to FHD the finest quality you can shoot in is 1920×1080 50p. Keep in mind that you can’t get the full capabilities of the HC-X1’s 5-axis image stabilization while shooting in 4K and only the optical stabilization, so it may be beneficial to drop down to UHD quality at times. Videos can be recorded in MOV, MP4 or AVCHD formats. There are two SDHC/SDXC card slots for storage to allow for continuous relay recording should one card fill mid-recording – a great feature to prevent you from ever losing footage. The Panasonic HC-X1 holds a built-in stereo microphone. The mic produces decent audio, but if you’re shelling out the cash for a machine like this one, you’ll likely be buying an external mic that’s going to record better audio than the built-in. Of course, if you’re going to be overlaying action film with music, you may not need to buy an external, and perhaps you’ll even be using lapel mics if you’re doing any sort of interview work. There are two audio-out ports on the camera body a 3.5mm headphone output and a 20mm speaker output as well. You probably won’t be shooting still images with the HC-X1, but if you’re in a pinch, the camcorder does take decent photos. The f/2.8 aperture of lens will shoot well in low light and produces 8.8 megapixel images (4096×2160). The images will be stored as JPEGs, so you’ll be limited with what you can do in post-production. But again, you’ll likely only be using this shooting mode on a very limited basis. There’s also an option for remote control of the Panasonic HC-X1: a wireless module and iPad. The AJ-WM50 or AJ-WM30 wireless modules (not included with the HC-X1) can be used to remotely control the camcorder. The AJ-WMXX remotes look like small USB thumb drives and connect to the camera. Then, you can use the AG ROP app for an iPad to remotely connect. Once tethered, you can adjust all the camera settings, adjust recording quality, start and stop recording at will, adjust the lens settings. You can also view a small preview thumbnail video on the device to check any recorded clips. There are analog output ports for audio/video out, as well as a port for HDMI out, which can export videos all the way to 4K quality. 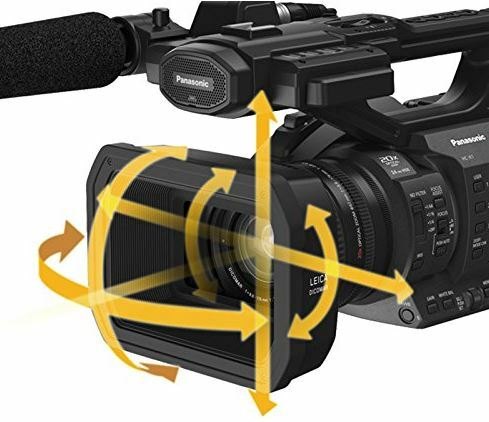 There are several accessories that come with the Panasonic HC-X1, and several available to purchase separately that will make your camcorder the ultimate recording machine and personalize it to your needs. The camera comes with an AC adapter and cable, a rechargeable battery pack and battery charger, lens cap and eyecup. Other accessories available for purchase include extra batteries, an LED light for shooting in minimal light/night, shoulder strap, external microphones and more. 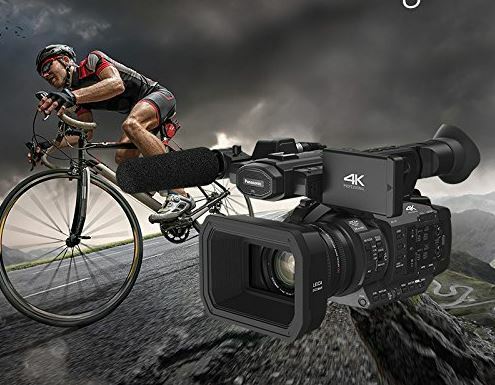 The Panasonic HC-X1 4K Ultra HD Professional Camcorder is a powerful machine that’s packed with great features that will allow you to record pristine 4K-quality footage with impressive optical image stabilization. Recording in UHD/FHD allows you make use of Panasonic’s 5-axis image stabilization to reduce camera-shake and produce smooth, steady videos. 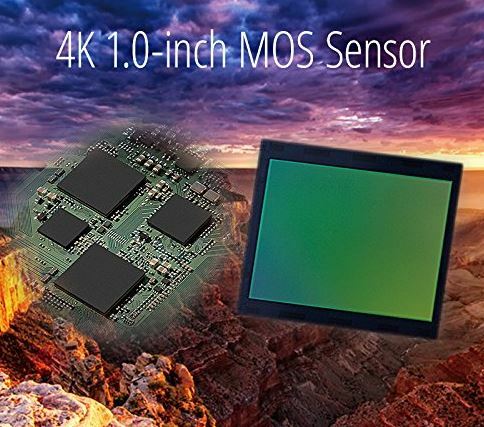 The large 1-inch MOS sensor offers up to 8.79-megapixel footage and produces a perfect balance between video quality and sensitivity. The Leica Dicomar 24mm 4K lens has minimal distortion in wide-angle modes. Additionally, the lens is powered by a 4-drive system that provides optimal quality and impressive optical zoom – up to 20x. The autofocus is fast and efficient, and the camcorder can also be controlled remotely from an iPad if you buy the wireless module. This is by no means an inexpensive investment, but if you can fit it into your budget, you won’t be disappointed. 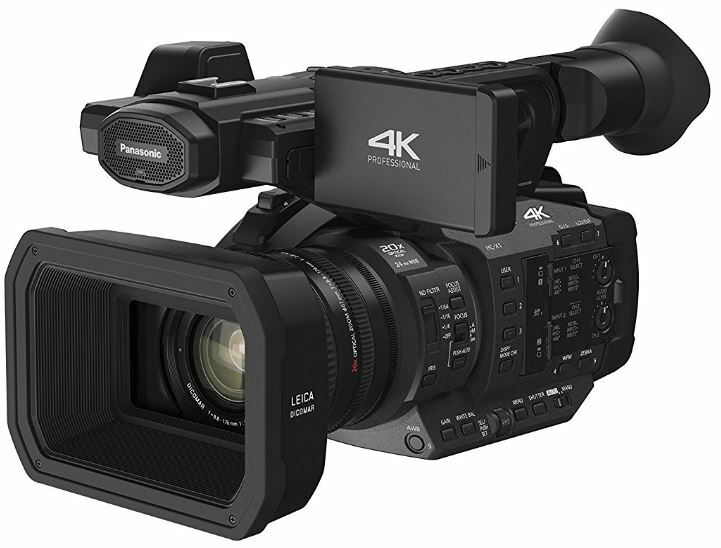 If you’re looking to get serious about your film-making, or just looking for an upgrade from your current video camera, the Panasonic HC-X1 4K Pro Camcorder is definitely a great option. I want to know if it can be mounted on a tripod so that I have the capability to use 2 of these for 2 different angles when videoing live concerts and edit them down.